Did you know that you can’t always tell using your ACoS whether you’re actually making a profit or loss with your Amazon Sponsored Products campaign? In this article we’ll explain why, and how you can correctly use your ACoS as well as the cost of sales of your keywords, ad groups, and campaigns. If you’re new to Amazon Sponsored Products, you can also read our Beginner’s Guide to Amazon PPC. Why is Amazon Sponsored Products ACoS important? Break-Even ACoS is one of the most important figures to look at in your Amazon Sponsored Products campaign. Based upon this figure, you can determine whether you’re making a profit or loss with your PPC campaign. If the actual ACoS is higher than your break-even ACoS, you’re making a loss, and if it’s below your break-even ACoS, then you’re making a profit. However, there’s a catch: Break-even ACoS is only calculated at the individual product level. This is because break-even ACoS is based upon a product-specific margin. Unfortunately, Amazon doesn’t provide ACoS per product, but only per campaign or ad group respectively. This means if you have more than one product in the same ad group, you could be making a loss running Sponsored Products ads for one product, but making profit on the other. If each product in your ad group has a vastly different break-even ACoS, the average ACoS for the entire ad group could be above the break-even ACoS for some products, and under for others. Therefore the question is, how can you determine if your Amazon PPC ad group is profitable overall? Below we’ll cover three different examples looking at how you should interpret your Amazon Sponsored Products ACoS, and if the ACoS is relevant for estimating profit in each scenario. If you have products in one ad group that have very different break-even ACoS figures, it will be difficult for you to determine whether profit is being made. This is because looking at your ACoS alone won’t determine this. 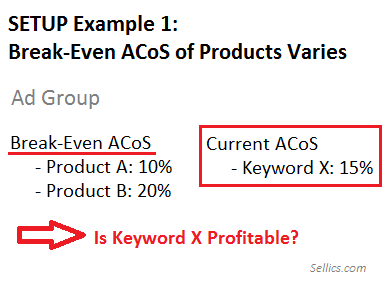 With a certain ACoS for Keyword X, which lies between the break-even ACoS of Product A and B, it could that profit and loss is made at the same time. This is because the overall profit made depends on how ad spend and sales are distributed amongst individual products – that is, how much profit or loss you make with each individual product. 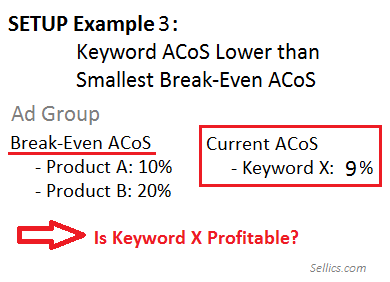 In this example, the ACoS of Keyword X with 15% is exactly in the middle of the break-even ACoS of Product A and B. The difference between scenarios I and II lies only in how ad spend and sales of Product A and B are distributed. Even though the ACoS in both scenarios is 15%, there’s profit made in scenario I and a loss in scenario II. Thus, if the products in an ad group have vastly different break-even ACoS figures, you cannot determine if your overall ACoS fulfills your profit requirements. The key to knowing if a keyword, ad group, or campaign is profitable requires you to calculate the target profit margin for your individual products. This can only be understood with much difficulty, if at all, in Seller Central. In order to look up the figures of individual products and keywords for your Amazon Sponsored Products campaigns, you have to export the campaign reports from Seller Central and work with them in a program like Excel to evaluate them. That’s why – in order to simplify evaluation and optimization – it’s recommended to put products with the same or very similar margins and break-even ACoS into the same ad groups (and campaigns, respectively). This way, your ACoS values are more relevant and will allow you to estimate whether the targeted profit was reached. In Example 2, Product A and B now have the same break-even ACoS. All other metrics remain the same. You can see how this affects the profit below. 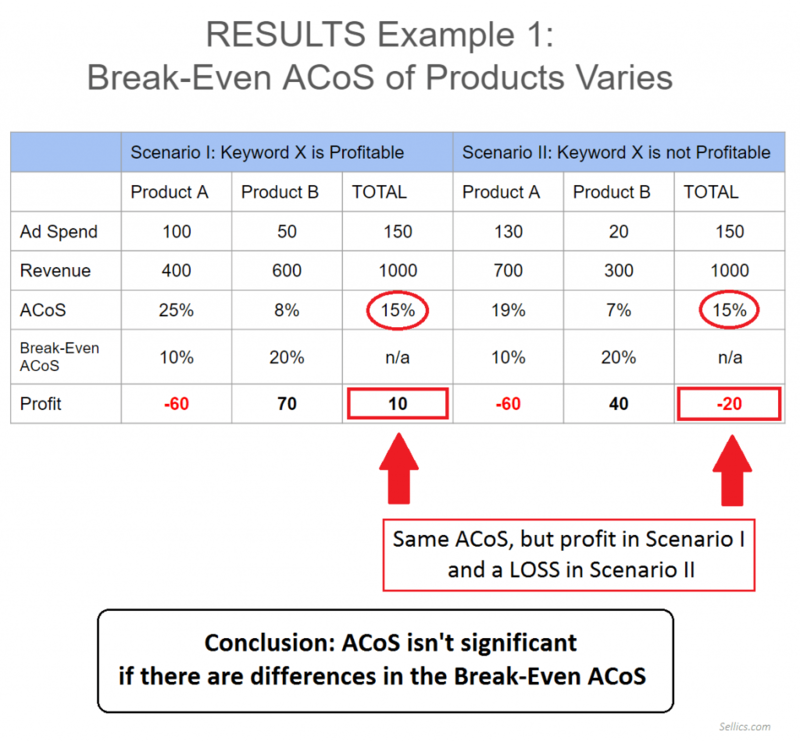 Because both products have the same break-even ACoS (15%) this time, you can estimate whether you’re making a profit or loss by looking at the ACoS of Keyword X. In both scenario I and II, different profit margins are still targeted for the different products. When summed up, however, the profits equals to zero – because the break-even point, aka the break-even ACoS, was reached. In contrast, if the ACoS figure was over the break-even ACoS, then you would make a loss, and if it was under, you would make a profit. 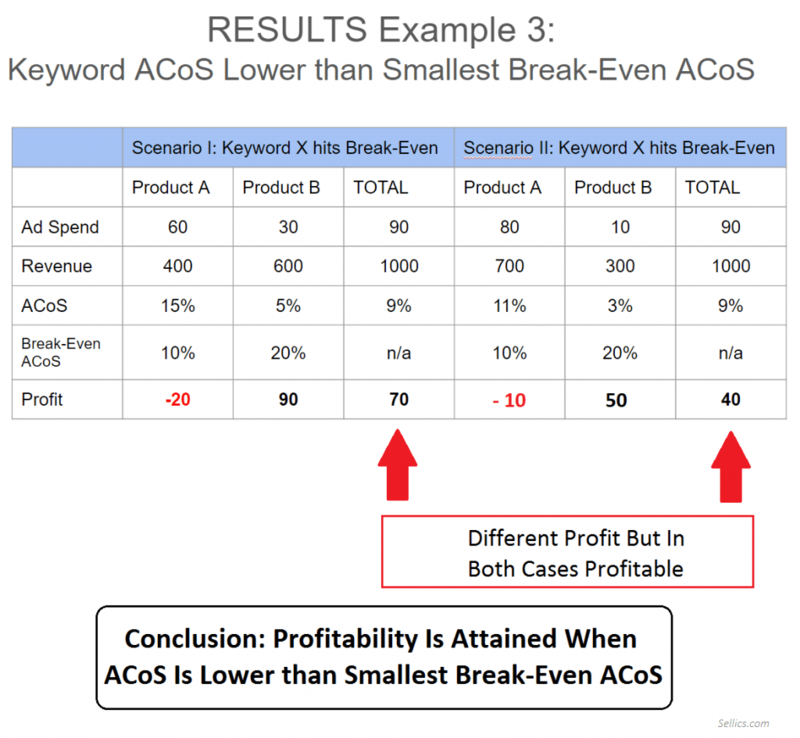 Here, the ACoS of keyword X can be directly compared to the break-even ACoS in order to estimate whether you’re making a profit or loss. 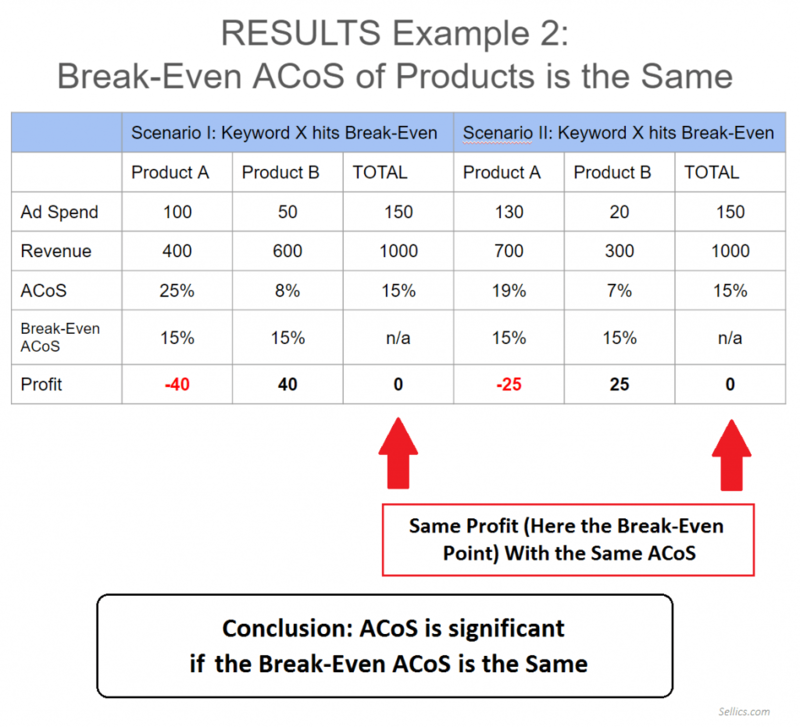 In this example, Product A and B again have different break-even ACoS figures. 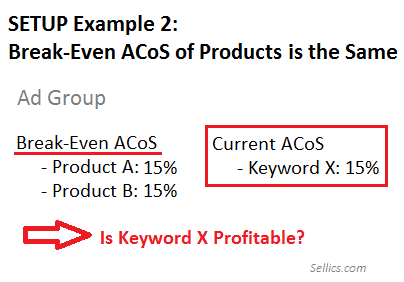 This time, the current ACoS of keyword X (9%) lies under the break-even ACoS of both Product A and Product B. In the following table, you can see how this affects profit. To find out if you’re making a profit or loss, you need to know how to interpret the ACoS of your keyword, ad group, and campaign. As we’ve illustrated in our examples above, your ACoS is only relevant to estimate profitability if the break-even ACoS is similar for your products in the same ad group. To enable your ability to estimate profitability based on ACoS, our recommendation is to only group products with similar margins and break-even ACoS in the same ad groups or campaigns.